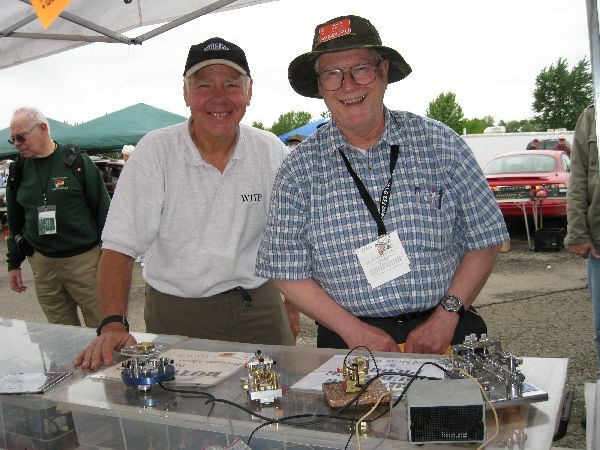 The Dayton Hamfest is the largest hamfest in the world. 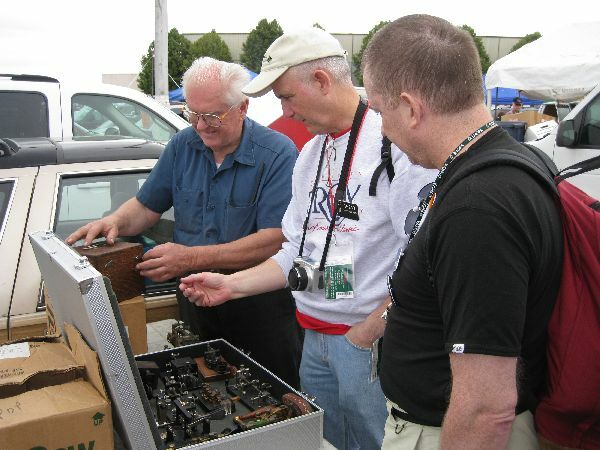 It is always exciting and has gradually evolved into not only a wonderful and productive place to hunt for keys, but also a social gathering place for key collectors. The following is a brief report of my experiences during the 2010 season. 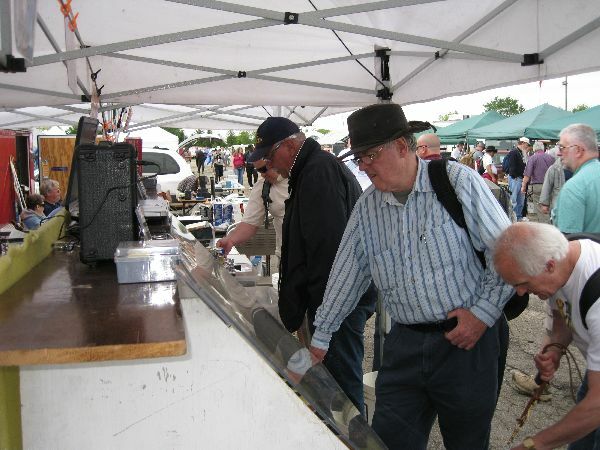 When I arrived at the hamfest on Thursday, setup day, the usual rainstorm was in progress but it was short and to everyone's amazement, the rest of the hamfest was held in very good weather. No dramatic keys showed up on Thursday but on Friday some of the most dramatic keys ever seen at Dayton began to show up and change hands. Keymaker Richard Meiss, WB9LPU was one of the early visitors to my tables. I had put out three of his most interesting keys and he helped me tweak them to perfection so everyone would be able to use them and compare them to the Melehan Valiant that I had on display. From Left to Right you can see his "ROTO BUG", his "DOUBLE-BUG" (Fully automatic), his incredibly small and smooth "PICO-BUG" and my Melehan Valiant. As the day progressed, not one but two of the rarest bugs of all time showed up. Gil Schlehman, K9WDY is seen enjoying his new Martin Autplex bugs. 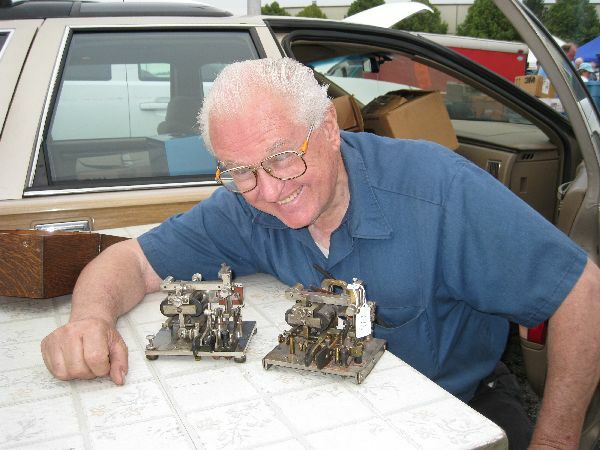 Gil has over 340 DIFFERENT Bugs in his collection and every time he can add a new one it is a major event. Swedish Collector Jan Skoldin, SM5LNE is shown on the right. Jan makes the long trip from Sweden to Dayton as often as possible to see and buy some of the wonderful keys that often show up. In addition to this very early McElroy bug in Gil's box of traders, you may be able to see a bit of a Vibroplex Vertical in the background and a Shawplex on the right. 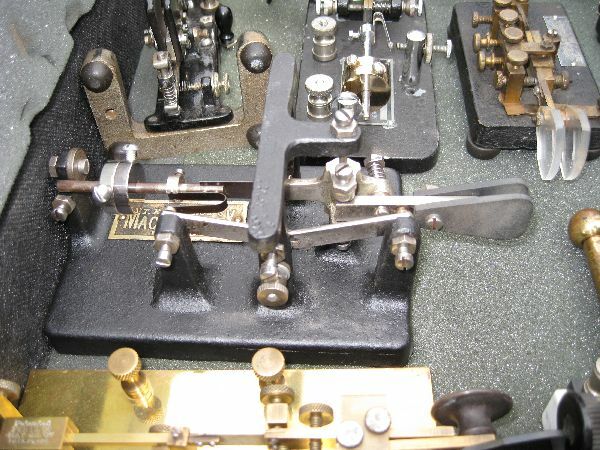 Dayton provides an opportunity to see and trade or buy some of the rarest keys in the world. I am sorry that I was so busy talking with hams, demonstrating Enigmas, and helping people adjust their keys that I did not have time to photograph the other exceptional keys that showed up and changed hands. 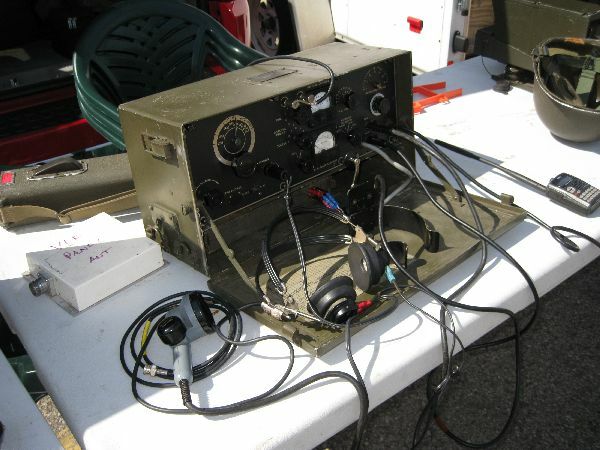 For WW-II Military Radio Enthusiasts, this lovely working BC-474 was nearly irresistable. It covers 75 and 80 meters CW and AM without modification. 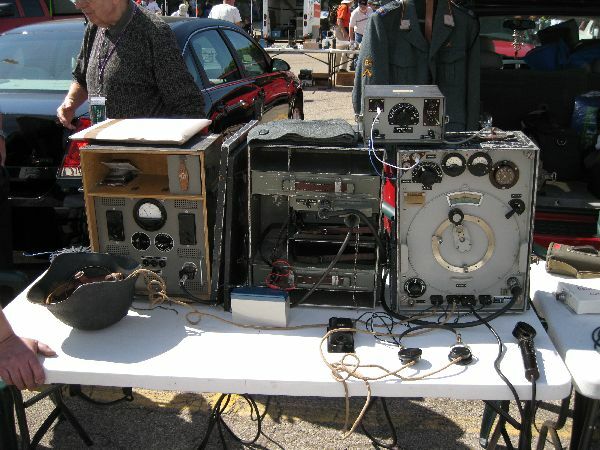 A complete and working German WW-II field radio station was set up and operating. Dayton has it's share of strange sights and strange people. 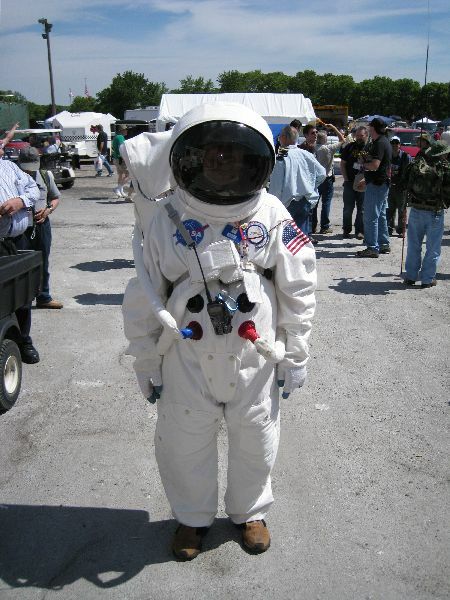 Here is my vote for the most creative portable radio outfit for 2010. Well, that's about it for Dayton 2010. I am already looking forward to Dayton 2011 when I will be set up with a much smaller display in the same spots around 2555. I can't wait to see what wonderful keys will show up next year ! !